The world economy is in crisis, and the political world leaders are unable to solve the issues at hand. The climate is changing and natural resources are rapidly decreasing. Dropping oil prices are causing countries to go bankrupt, while other countries are desperately trying to keep afloat. 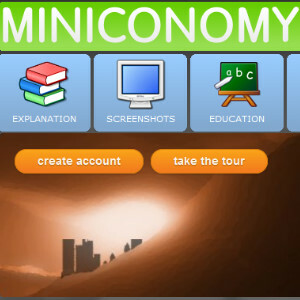 In Miniconomy, the inhabitants are free to shape the economy and the political systems as they see fit. Establish a vast trading network with others, and deal with the politicians that shape the country to their liking. Or take on the role as politician yourself, and harness the riches of traders for the good of your country, or yourself. Wealth, bankruptcy, power and suppression, crime and ecological disasters are all yours to master: in Miniconomy, anything is possible.